As the hardworking staff has diligently noted, all kinds of news organizations are busily marketing their truthfulness and reliability to a skeptical public. Call the roll: New York Times, Washington Post, Wall Street Journal, Boston Globe, and some outfit called News Media Alliance. 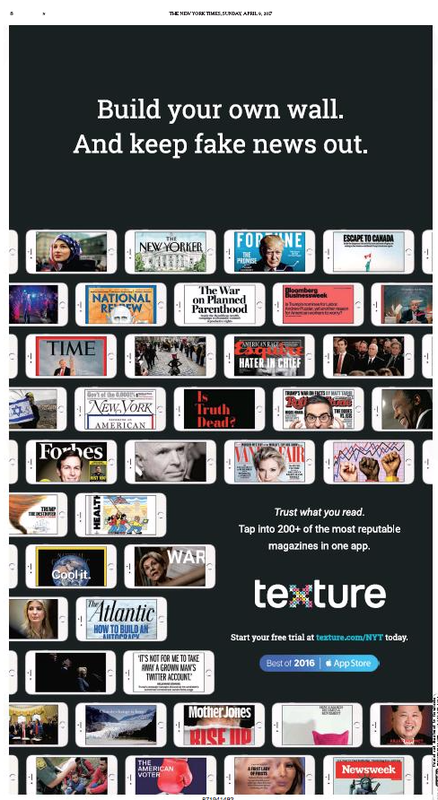 Now come two more – the Financial Times and the Texture app. 11 April 2017: The Financial Times today launches a marketing campaign challenging readers to think beyond ‘black and white’ and turn to the FT for a more complete perspective on the news agenda . . . 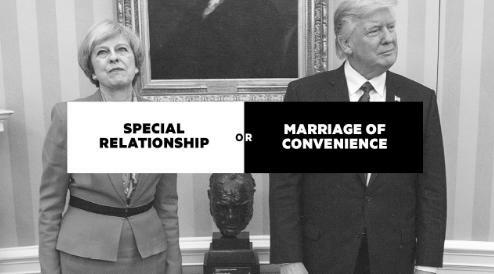 The creative images feature issues and events driving the news agenda as overly simplified dichotomies presented in black and white, before prompting readers with the line, ‘For the full perspective, turn to the FT.’ The campaign demonstrates how the FT takes readers beyond the headlines and helps them make the right connections in complex and uncertain times. Next up is this full-page ad from Sunday’s New York Times. We can’t figure out if all this effort is a) preaching to the choir, or b) whistling past the graveyard. Probably both, come to think of it. This entry was posted in Uncategorized and tagged Boston Globe, Boston Herald, Dean Baquet, Democracy Dies in Darkness, Financial Times, Grey Lady, John Carreyrou, News Media Alliance, Pep Squad for Truth, t-shirts, Texture, The Face of Real News, Two-Daily Town, Wall Street Journal, Washington Post. Bookmark the permalink.